The corporate governance model adopted by Cielo includes principles concerned with ethics, transparency, equity, accountability and corporate responsibility, essential for the sustainability of any business and in line with the best current corporate governance practices. Cielo incorporated strict corporate governance standards into its values and daily business, voluntarily, which exceed the requirements of law, always ensuring the practice of ethical and sustainable conduct. As Cielo believes that a solid governance model inspires greater confidence in the market under several aspects, one of the Company’s goals is the continued improvement in pursuit of the most advance governance level, aiming at maintaining a proper balance in the allocation of rights, powers, obligations and responsibilities amongst all the stakeholders, and, a result, maintain a healthy and efficient operation, thus, generating value in the long term. Cielo adhered to the BM&F Bovespa’s “Novo Mercado” on June 29, 2009, bound to the Market Arbitration Panel, pursuant to the arbitration clause provided for in its Bylaws. It is worth pointing out that the listing in this segment implies to adopt a set of corporate rules, which enhance shareholders’ rights, besides a more transparent and comprehensive disclosure policy. The Company’s American Depositary Receipts (ADRs), Level 1 have been traded since 2011 at the International OTCQX market, the US market premium segment, which recognizes major international companies of other securities traded in the US OTC market for the quality of their operational businesses, excellent disclosure of information and listing in qualified foreign stock exchanges. For Cielo, the governance system optimization is one of the paths to achieve greater efficiency and add value to the Company, keeping the stakeholders’ confidence high. Have a “Related Parties Transaction Policy and situations involving conflict of interests”, whose guideline is to ensure that the Company’s controlling shareholders do not take part a priori in decisions in which they can be benefited, composed of a set of rules which includes not only prevailing laws providing for this issue, but also the best corporate governance practices. Following carefully, without exceptions, this set of practices confers strength and reliability to Cielo in the long term. Cielo’s Corporate Governance Department was created in 2014, an independent body, liable for (i) Cielo promoting the strict compliance with the best governance practices, (ii) ensuring the transparency of information provided to the Company’s governance bodies, (iii) ensuring the observance to the system adopted by the Company in the decision-making process, ensuring the interests and the quality of the Company’s decision-making process, contributing to its best performance and to reduce the risk of business. The Company is managed (i) by the Board of Directors, composed of, at least, seven (7) and, at most, eleven (11) members elected by the General Meeting, with two-(2) year combined term of office, and reelection is authorized; and (ii) by the Statutory Board of Executive Officers, composed of, at least, two (2) and, at most, ten (10) members, one (1) Chief Executive Officer, one (1) Investor Relations Officer and up to eight (8) Officers without specific designation, elected by the Board of Directors, with two-(2) year term of office, and reelection is authorized. The Statutory Officers are authorized to cumulate positions, as resolved by the Board of Directors. The Company’s Bylaws accepts the creation of technical and advisory committees, referred to as advisory committees or forums, which are supporting instruments to enhance the quality and efficiency of the Company’s management bodies performance, so that to maximize its value, always observing the principles and the best corporate governance practices. The installation of Advisory Committees or Forums shall be incumbent upon the Board of Directors and/or Statutory Board of Executive Officers of the Company, where applicable, only the Audit Committee shall operate on a permanent basis. a) Board of Directors’ Advisory Committees: (i) Audit Committee; (ii) Corporate Governance Committee; (iii) Finance Committee; (iv) Innovation Committee; (v) People Committee; (vi) Risk Committee; (vii) Sustainability Committee. The competence, composition (including requirements and impediments applicable to members) and operation of Advisory Committees are provided for in the charters of each Committee, which were approved by the Company’s Board of Directors. Likewise, the competence, composition (including requirements and impediments applicable to members) and the operation of Forums are provided for in the charters of each forum, which were approved by the Company’s Statutory Board of Executive Officers. The Company’s Bylaws also provide for the eventual installation of a non-permanent Fiscal Council, an independent oversight body of the Statutory Board of Executive Officers and Board of Directors, with responsibilities and powers granted by laws. Since its operation is not permanent, the Company’s Fiscal Council may be installed by the General Meeting as requested by shareholders, in the assumptions provided for by laws. Currently, the Company has a Fiscal Council, installed at the Annual General Meeting held on April 20, 2018. Cielo’s shares are listed on the Novo Mercado segment, a segment of the stock exchange destined to the stock trading of companies which, voluntarily, adopt corporate governance practices additional to those required by Brazilian laws. The listing at this special segment implies the adoption of a set of corporate rules broadening shareholders’ rights, besides the adoption of more transparent and comprehensive information disclosure policy. 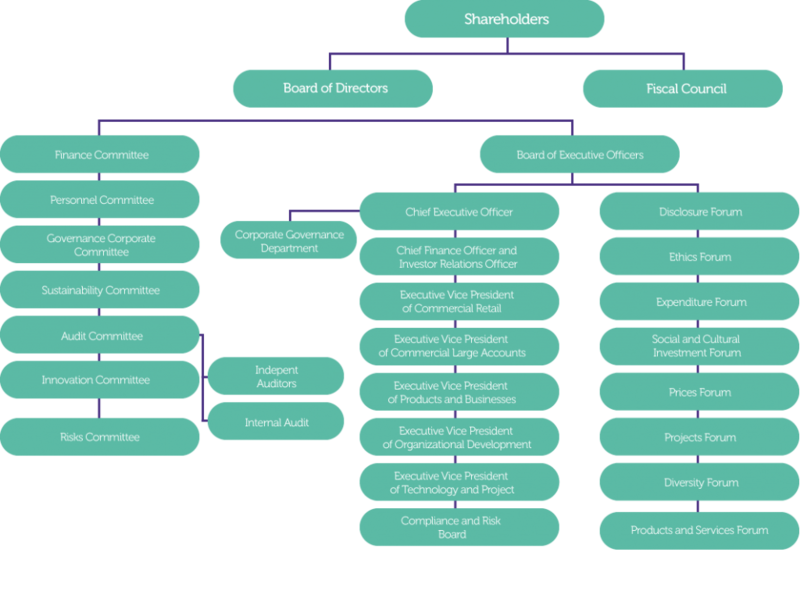 The Company shall provide in its bylaws that its board of directors is composed of, at least, two (2) independent board members – or twenty percent (20%), whichever is the greater, with a combined two (2)-year term of office, and reelection is authorized for members of its board of directors. Adhesion to the arbitration clause. We strictly follow our related party transaction policy, which mandates that our controlling shareholders do not participate in decisions they can benefit from. An example was that the resolution on Cielo’s minority interest in Stelo was made solely by independent members of the Board, without participation of members representing Cielo’s controlling shareholders—namely Banco do Brasil and Bradesco—, which also control Stelo. Following the same principle, only independent members and Bradesco representatives voted on the creation of Cateno, after the association between Cielo and Banco do Brasil announced in November 2014. Copyright 2019 Cielo. All rights reserved.